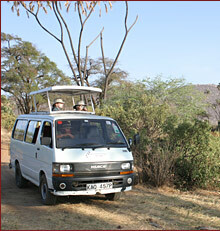 All our safaris are conducted in luxury seven-seater minibuses. However, upon request, we can provide you with a four-wheel drive vehicle such as a Land Cruiser. Our buses are fitted with long- range radios for easier communication with the office and to ease wildlife sightings. Each van is fitted with a cool-box and adequate clean mineral water to make your ride as enjoyable as possible. Our vehicles are regularly and meticulously maintained to ensure your comfort and safety. Most transport on safari is by minibus. However, some clients prefer to fly. Flight service to Mombasa is affordable and easily arranged. Upon request, we can arrange for flight service to certain destinations, such as Maasai Mara or Tsavo. Plane fares to such destinations will incur an additional charge. Please let us know if you want us to arrange a scenic second or first class train ride throughout Kenya.